Billionaire business magnate and fearless adventurer Sir Richard Branson is getting ready to become the first commercial astronaut. But until that happens, Branson is getting his adrenalin fix with yachting adventures. In addition to business endeavours that include trains and planes (and soon space shuttles), the tycoon also has a 105 foot luxury catamaran called Necker Belle. According to Branson, he has always been passionate about the ocean and has been an avid sailor since his youth. One of the most exciting experiences he claims to have had was in 2012 while cruising around Silver Bank in the Dominican Republic on the Necker Belle when he ended up swimming with humpback whales. Necker Island is Branson’s private island retreat in the British Virgin Isles and is widely known as the entrepreneur’s favourite place to be. After buying the island, Branson purchased a yacht for £5.3 million, and named it after the island where it is based. The catamaran used to be named Lady Barbaretta and went through a two-year refit before becoming the Necker Belle. The refit won an award at the World Superyacht Awards in 2010. As one of only a few luxury catamarans sailing around the world and also able to sail faster than 20 knots, the Necker Belle is an exclusive seafaring vessel. 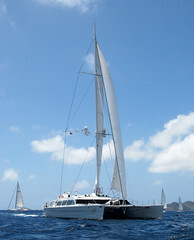 Branson’s yacht is operated by Captain Beez Evans and seven crew members that look after the needs of up to 12 guests. The yacht is geared for fun and has an open-air cinema, several swimming platforms, beach club styling and a 6-foot diving board. It also offers guests the opportunity to enjoy water-skiing, game fishing and scuba diving, or spend their days exploring the water toys that include Hobie Cats, paddleboards, wakeboards, dinghies, snorkelling gear and inflatable towable toys. For submersible fun the Necker has the Necker Nymph – an excursion submersible that is uniquely buoyant when not under power. Evenings can be spent sipping on some of the fine wines, top quality spirits, champagnes and beers kept in the Necker Belle’s on-board cellar. Richard Branson is an English entrepreneur, investor and philanthropist. He is the founder of the Virgin Group that comprises of more than 400 companies. Branson was born in London to an air hostess mother and barrister father. He attended several schools but suffered with dyslexia and was not academically inclined. On his last day of school the principal told Branson that he would either become a criminal, or turn out to be a millionaire. Branson started his very first business when he was only 16, a magazine called Student. At age 20 he set up a mail-order business selling records – two years later he launched a chain of record stores called Virgin Records. The brand grew quickly and Branson’s entrepreneurial endeavours were eventually so impressive that he was acknowledged by the Queen of England when he was knighted. The Virgin Group is not only involved in the music industry, but also commercial aviation and space flights, banking, books, health care, Internet, films, radio, retail and travel. Branson has an estimated net worth of US$5 billion.